Assemble designed a zinc passivated steel chair which is used in the cafe of Goldsmiths CCA, fabricated by Cake Industries. The chair seat is made from a single piece of thin metal, just 1.5mm in thickness. The fabrication process involves the production of a laser cut flat template which is then simply folded and riveted to create a rigid shell. The shell is attached to a leg frame made of 15mm tubular steel using 5 rivets. 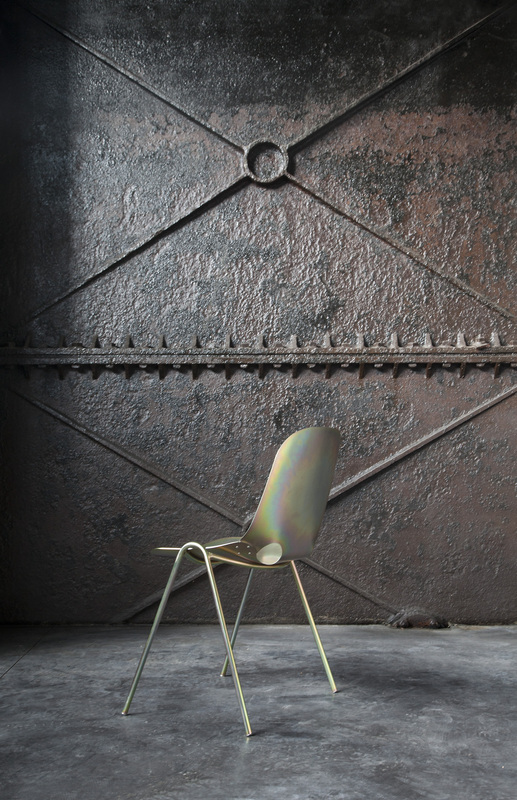 The chair is given a bright iridescent finish using an industrial process called zinc passivation, typically used as a coating for industrial components to give them corrosion resistant properties. An edition of the chair will go on sale shortly. Please keep a look out on our Instagram and subscribe to our mailing list if you would like to be notified when it is put into production.